The first concrete has been poured for unit 2 of the Shin Hanul (formerly Shin Ulchin) plant in South Korea. 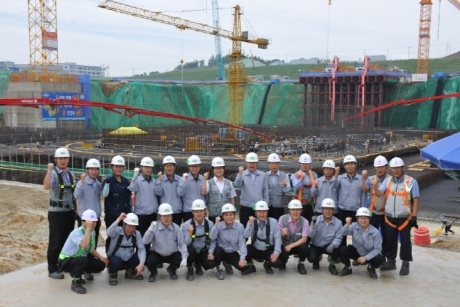 A ceremony was held on 19 June to mark the pouring of first safety-related concrete at Shin Hanul 2, marking the official start of construction of the Korean-designed Advanced Pressurised Reactor-1400 (APR-1400), Korea Hydro and Nuclear Power (KHNP) announced. Government approval for the project to build Shin Hanul units 1 and 2 was given in April 2009, when a price of 7 trillion won ($6 billion) was put on it. Major contracts related to the plant's construction were signed in March 2010, with detailed site studies starting the following month. Groundbreaking for the first two units at the site took place in early May 2012. First concrete for unit 1 took place last July. Unit 1 is expected to be completed in April 2017, with unit 2 expected to be finished one year later. The Shin Hanul units are the second pair of APR-1400s to be built in Korea - two are already under construction at Shin Kori. Two further APR-1400 units are planned for Shin Hanul. South Korea currently has 23 power reactors in operation, providing about one-third of the country's electricity. The addition of Shin Hanul 2 takes the number of units under construction to five.